In a short interview on Fox Business News, Jeff Saut of Raymond James Financial told Dagen McDowell he doesn’t believe the Cyprus banking crisis will spread to other banks and the world is profoundly underinvested in U. S. equities. He expects U. S. stocks to continue to outperform international equities, as he sees a switch out of fixed income into stocks. McDowell asked Saut about the implication of the pervasive bullishness of guests on the news network. 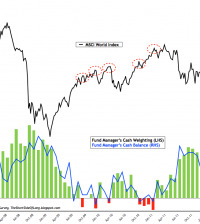 Saut said he doesn’t see it that way and encounters some people who are profoundly bearish. Saut said there have been five Dow Theory buy signals since the bottom in 2009 and the indicator has only given one false signal in the past fifteen years, which was the flash crash in 2010. There was a reconfirmation of the Dow Theory buy signal three weeks ago when the DJIA traded out to all-time highs, thus confirming the transportation average’s like move in early January, he added. Saut stated he believed dips were for buying. Saut concluded for the bull advance to end it would take a black swan event such as closing of the Hormuz straits and crude oil going to $200, or a huge policy mistake out of the DC beltway, which he doesn’t see either of on the horizon. Back in early January, Saut commented on back to back 90% upside volume days which occurred immediately after New Years day and said it was a mistake for investors to get too bearish [link]. The market is delivering manna from heaven!